Six basic plots support most stories told, which stories do you like to tell? Storytelling is valuable skill. Studying it helps you get better. There is a category that was added to this blog for storytelling. A recent BBC article nicely covers the idea that there are six basic plots. Researchers analysed over 1700 novels to reveal six story types – but can they be applied to our most-loved tales? Miriam Quick takes a look. If you want to see the origin of concept check out this video that is good for a laugh. The computer analysis of the story was covered 2 years ago in MIT Technology Review. Kurt Vonnegut came up with this idea of the shape of stories for his master's thesis in anthropology at University of Chicago. If you are still curious check out the paper which goes into depth on the idea that there are six shapes dominate stories. Here is the shape of Harry Potter and the Deathly Hollows. For years I have studied and valued the skills of a storyteller. An example of a story told well applied to the data center industry is the story of In Tents Computing. The story was originally written in 2008. It has been long enough that I can share some of the inner parts of the story. One of my friends wrote the story and she is a great writer, working at Microsoft for years in a range of roles. The first week of her job at Microsoft we met when she worked as a paralegal in the Microsoft legal team that supported the Microsoft font group where I worked. Does that sound boring? It was, but it is important to get fonts done and cleared by legal to ship Windows. Back to the story referenced https://blogs.msdn.microsoft.com/the_power_of_software/2008/09/19/intense-computing-or-in-tents-computing/. The engineers doing the work were Christian Belady and Sean James, and Mike Manos said the team did some interesting work and it could be a good blog post. The excitement in the writing department came when Slashdot picked up the story https://m.slashdot.org/story/107413 and many other trade publications. What was funny to Mike Manos, the writer, and myself is how there was so much trouble caused in the company. Why? Because on the same day that the In Tents computing blog post went up Microsoft VP Debra Chapraty was at the opening ceremony of their 2nd data center in San Antonio and instead of the news being about San Antonio and the Microsoft executives, the news was discussing servers put in tents. Telling a good story can be powerful and it is what i keep in mind when moderating presentations at Structure Conference. The three presentations I am moderating are as follows. These may seem boring, but not nearly as boring as discussing fonts. :-) Athough to be fair fonts did make it into a Ted Conference where Matthew Carter discussed the crazy idea of why we created Verdana. At the end of this post is Matthew telling the story of Verdana. Stories work, but are so hard to do well. Juniper began its journey to transition its corporate applications to the cloud six years ago. While the company expected to complete that transition this year, the task at hand isn’t as easy as it sounds. There have been many takeaways and lessons learned that Bob’s team has bundled into a “playbook” – outlining best practices on how to achieve zero physical data centers, how to overcome the hurdles and why the process is more difficult than many realize. In this discussion, Bob will share why it’s so hard to get to zero data centers and detail how your company can successfully see the light (i.e. the cloud) at the end of the tunnel. Kubernetes as a Hybrid Cloud Platform: Federating Across Public, Private and Edge. Is it another workload orchestration technology, or is there something deeper driving Kubernetes adoption? Numerous factors have contributed to its success, including its origins in Google's infrastructure, the open source community contributing momentum, and real world deployments that speak clearly to its value. One use case stands out in terms of its relevance to the enterprise: Kubernetes as a hybrid cloud platform. In this panel distinguished leaders discuss this and offer insights for future evolution in the space. Everywhere you look, it's all about containers. It's clear containers will be the path forward for application virtualization and the convenience it brings to IT app management and workload transportability. In this panel we talk to three of the leading technologists in the industry who are putting themselves and their customers behind a container rich future. Come learn what containers will really mean for you. Building the Best Software Services, can you find the secret guild? I have been the bay area for the past two weeks for business meetings before I head back to Redmond. Actually haven’t been here for two weeks straight, taking two trips. I’ve lived for 22 years in Redmond, and before that spent 32 years in Silicon Valley. I go back and forth often enough that I have an office space in both locations. How Silicon Valley works is different than Seattle/Redmond, but there is a common trait. The guys who belong to the secret guild of low level programmers who can build services that scale and run like an energizer bunny. Working on OS at Apple and Microsoft got me used to working with the developers who belong to the secret guild. What is the secret guild? Here is a post that tells the story. "You have too many hipsters, you won’t scale like that. Hire some fat guys who know C++." It’s funny, but it got me thinking. Who are the “fat guys who know C++”, or as someone else put it, “the guys with neckbeards, who keep Google’s servers running”? And why is it that if you encounter one, it’s like pulling on a thread, and they all seem to know each other? Read the post to get the rest of story. For those of you too lazy to click on the link, here is the closing paragraphs. Finally, the implicit compact that the Guild makes with a company is that their efforts will not be in vain. The most powerfully attractive force for the Guild is the promise of building a product that will get into the happy hands of hundreds, thousands, or millions. This is the coveted currency that even companies that have struggled to build an engineering reputation, like foursquare, can offer. The Guild of Silicon Valley is largely invisible, but their affiliations have determined the rise and fall of technology giants. The start-ups who recognize the unsung talents of its members today will be tomorrow’s success stories. I’ve written a few posts on the importance of Visual/Spatial Thinking. Are Spatial Skills one of the under valued skills of a data center engineer? I”ve watched Temple Grandin’s Ted Video. But, it took the movie on Temple Grandin to understand Temple Grandin’s story and what she went through to develop her skills. Here is a behind the scenes movie that gives you some of the feelings behind the movie. 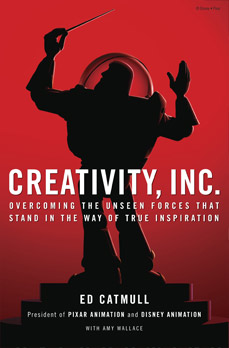 I just got the book Creativity Inc to read which is the story of developing Creativity at Pixar by the CEO Ed Catmull. WSJ wrote a review with some good lessons. Here is a good one on why many technologies fail. The technology is not embraced by the users. Recruited in 1979 by George Lucas to help work special-effects images into live-action footage, Mr. Catmull, who had studied computer graphics in graduate school, soon found himself up against a problem that would yield one of his early lessons. The film editors at Lucasfilm resisted working with a computer. They didn't think it would do much more than what could already be done by snipping filmstrips with razor blades and gluing them together. The editors didn't realize that, for a new level of creativity to happen, they would have to embrace change. Relatedly, Mr. Catmull realized that a transformative idea, no matter how good, was useless unless the people who had to implement it fully embraced the concept.